Right then. This is the continuation of the An Ember in the Ashes series that nearly everyone seems to gush over but me. I’m not sure if it’s just the over-hype or the fact that it takes a long time for me to get into the story, but I feel like this series is kind of…boring. Which bums me out. It has all of the hallmarks of what I should like in a series, but for some reason I just can’t lose myself in it. I thought that this one would be better than the first because Ember was a debut novel, but A Torch Against the Night was only marginally better for me. I keep reading them because I want to see what it is about them, but once I finish the book I’m not really enthusiastic about it. 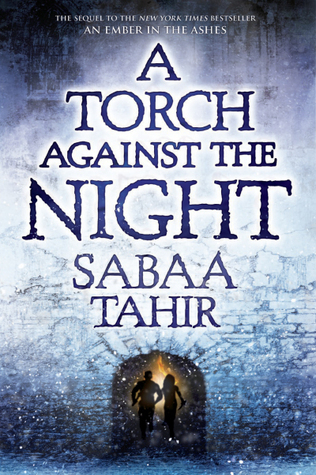 A Torch Against the Night begins where Ember left off, with the results of the Trials and the flight of Laia and Elias. They’re desperate to get out of a city where their descriptions are known, desperate to try to rescue Laia’s brother from the dreaded Kauf prison. Though they’re unlikely allies, Laia and Elias work together because they both don’t believe in the Martial Empire. When the burden of the journey falls heavily on Laia’s shoulders, she has to decide if she will allow it to break her or if she will rise above the hardships and be reforged anew. Torch is a book that deals in the reforging of characters. Whether you’re a slave Scholar, a ruling Martial, or a free Tribeswoman, the choices that you make thrust you toward a new self. Often the characters would fight against the inevitability of their breaking point, other times they would run toward it because they knew they needed to change. Actions have a lot of consequences in this book, even more so than what I remember from Ember. It ups the ante a little bit by pitting former friends against each other. I liked how the characters all related to each other because of this reforging of self. Additionally, the different paths that the reforging could take was explored with each individual character. Not all of them made it to the other side whole. Parts of their reforging are really well done in concept, but not really expanded on in a way that makes me feel like it’s true character growth. For example, I think it was extremely important that the idea of choices and being able to make your own regardless of the danger or potential consequences was realized in Elias’ point of view. He’s constantly a protector, but you can’t always protect everyone. And you certainly can’t hold people back from making their own choices or block them from making their own choices. When he realizes this, I thought that it was going to be a pivotal moment of growth. Instead, I feel like he realized it, and then we’re sped along to another moment. And later he seems to have forgotten this entirely. The strongest character in regard to this reforging concept was clearly Helene. I am so glad that her point of view was included. She is by far the strongest character in general. I loved reading how she really struggled with her duty to the Empire and her love for Elias and her family. Again, though, there were moments when the tragic aspect of her character–being stuck in the worst of rocks and hard places–wasn’t really expanded upon. She ended up being the only character I really cared about. Both Laia and Elias have changes to their characters as well. While Helene’s point of view deals a lot with the mundane world of the Empire, the other two delve into the territory of myth. I know that Ember had jinn and ghuls, but there was just something so odd about it. I complained about the lack of world-building in Ember; that problem continues in Torch and becomes even more problematic when I consider the attempt at creating a mythology. I just couldn’t see it. I felt that the expansion upon the world of myth as connected to the real world was purely to explain why Laia and Elias are special and Meant For Great Things. Again, like character building, if I’m not given enough about the world, I don’t really care about it. I feel like Elias and Laia are archetypes and not characters. They just do what their archetype drives them to do. Laia is the one who will somehow (eventually) overthrow the Martials, but we don’t know just how special she is yet. Elias continues to be a blank-slate who wants to protect all of the helpless people in order to atone for his sins as a Mask. Another character who suffers from a lack of character development is the Commandant. In Ember, we were told that she did in fact care for Elias briefly rather than leaving him the desert alone as we were initially told. That glimpse of her as a multi-faceted villain was completely dropped in Torch. She is 100% evil in this book and there is absolutely nothing redeeming about her character. I can’t even see her as a great villain because I haven’t seen enough of the motivations behind her actions in Torch. The only thing she doesn’t do is laugh manically. Villains and heroes are more than just their role. Write that. Again, the romance that was in the novel served merely to check the box that all young adult novels need to have a “love triangle.” Completely a case of instant-love because they all think the person of their affection is pretty. There isn’t much more to say about it. It’s there, it happened–and I still don’t see why they like each other. So, this review has been chock full of negativity, but finished the book and enjoyed it once it finally got into the action. I had hoped that the issues that had been present in Ember would have resolved themselves by Torch but was disappointed. I know that this will continue to be a favorite series for many, but I don’t think that I will ever devour this series with the intensity that others feel. The problems outlined above will likely continue into the third novel. While it’s not as bad as the last one, I have problems with books that take so long to get into the action like this one does. There are two more books planned for the series and as I don’t really understand how there’s going to be enough plot and conflict for two more books, I’m dropping this one. I received this book as a book club book, so thank you!